Not every Shih Tzu's hair is the same. They do not shed, but some Shih Tzu's do lose hair more than others. Not every shih tzu grows hair at the same rate. Some have flowing long tails in no time, others it takes longer and some Shih Tzu simply won’t grow their tail hair to the ground. 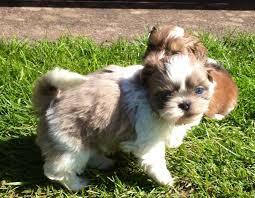 Some Shih Tzu's have hair that would never come out and sometimes their hair can be more easily pulled out. All of which could be normal, however if you want a show dog, you will want to make sure that your puppy has the hair for it . Occasionally in a litter of perfectly healthy and wonderful Shih Tzu puppies you will get a puppy that seems to be a little different as far as their hair growth goes. You generally don’t notice this until the puppy is around 6 weeks old and sometimes later depending on whether you have a partial or a full Prapso puppy. Most people have not heard of this condition and it used to be primarily thought of as a Lhasa Apso Condition, because that is where it was seen most often. They called them “smooth haired” Lhasa’s. The word “Prapso” started in Australia. From the phrase “perhaps an Apso” This “condition” however is not limited to the Lhasa Apso. 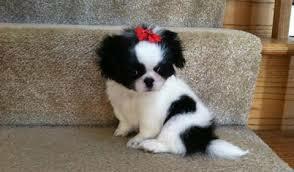 It is periodically seen in the Shih Tzu as well as other Tibetan breeds. So just what is a Prapso? Prapso puppies are an interesting occurrence. They are perfectly healthy little babies. A Prapso puppy will mature faster than his litter mates, usually will open their eyes earlier than normal, They will get a full set of teeth much earlier than their littler mates. In general they tend to have a more rambunctious personality. They also for whatever reason are thought to be slightly smarter than other dogs of their breed. But what is most noticeable is their shorter than average hair for their breed. In a full Prapso they will have shorter smooth hair, generally over their entire body however their muzzles and legs are generally shorter than their body, a Lhasa Apso looks almost identical to a Tibetan Spaniel if he/she is a full Prapso puppy. You can also have a partial Prapso, which is what I have seen in the Shih Tzu. A partial Prapso will generally have longer hair on the body, but it may not grow to the ground like a flowing show coat. There may be long hair on the face and head where your typical top knots can be done, but generally right around the muzzle will stay short and the legs will be shorter than the body, They can grow longer than a “smooth hair” look, but generally will not grow as long as typically seen on a Shih Tzu, but their hair will still have a straighter/smoother appearance with a slightly different texture than a typical Shih Tzu. Prapso puppies/dogs make excellent pets. 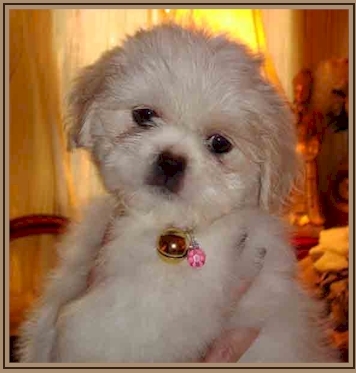 You get the loving, fun, playful and loyal personality of the Shih Tzu without all the hard work of the long coat and profuse hair. If you keep your shih tzu in the shorter coat then the shorter hair is a non-issue. Prapso’s are not uncommon. The problem is a lot of breeders do not know about this condition and as a result does not recognize the signs. Reputable breeders that are aware of this will simply sell the Prapso as a pet and educate potential buyers about how their puppy will be different if it is possible to tell before the puppy goes to his/her new home. However, some not so reputable breeders know exactly what a Prapso puppy is and choose not to tell buyers that the particular puppy they are interested in is a Prapso. A buyer can and usually will be very confused and disappointed in their puppy if they are not educated about this condition. 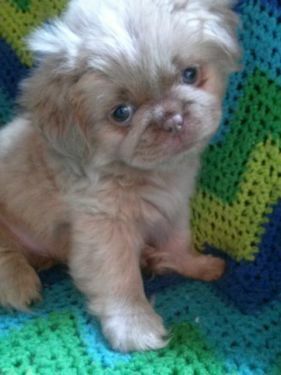 If the buyer is looking for a show-quality Shih Tzu, the puppy or dog could then suffer from the results of a disappointed buyer, he could wind up in a shelter or worse homeless. A loving pet owner could spend unnecessary time and money and mental anguish trying to figure out what is “wrong” with their puppy. The Prapso puppy makes an absolutely wonderful, smart, affectionate, playful, somewhat low maintenance alternative to their breed standard counterparts. People that have owned Prapso’s are known to ask for another one as they realize what a joy they really are. The Prapso puppy is nothing to be ashamed of. On the breeder side of things, obviously, most breeders do not produce a Prapso puppy on purpose. They can just “pop up” every once in a while and no one really knows why. There are a lot of breeders that have had a litter or more with a Prapso puppy. 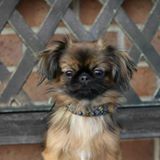 There are theories that the Tibetan spaniel was mixed into the Lhasa and Shih Tzu breed many years ago in Tibet, and they are the result of this practice. Some people just believe it is a genetic mutation that for whatever reason results in this characteristic. Regardless, it is not recommended to pull a dog that has produced a Prapso out of a breeding program, however it is advised that the particular breeding not be duplicated and if that dog produces a prapso from a different breeding then it can be assumed at that point that he/she is the carrier as it is my experience that it only takes one parent to produce a prapso puppy, both parents do not have to carry for it. A female that produces Prapso’s is very limited in the amount of puppies she can produce and because of this should just be bred to a different male to see if it was her or the male that carried for it. A male that produces Prapso puppies should be handled a little more careful as obviously they can produce many offspring. Litters that a male produces should be closely tracked and bred carefully, just because he is a carrier doesn't mean all of his puppies will be however there is that chance of the carrying for it. Just because a litter is born with a prapso you cannot assume both parents carried for it as mostly likely only one of the parents were a carrier. There are those breeders that have actually got requests for another Prapso and therefore have purposely produced Prapso’s. This has been seen mostly with the full Lhasa Prapso’s as you get the temperament of the Lhasa, without the hassle of all the hair. This would generally be frowned upon with most show breeders; however most breeders each have their own reasons as to why they breed and what their goals are for their programs. In the end a Prapso puppy is a perfectly healthy pet that can bring you years of love and affection. but generally will not grow as long as typically seen on a Shih Tzu, but their hair will still have a straighter/smoother appearance with a slightly different texture than a typical Shih Tzu. Prapso puppies/dogs make excellent pets. You get the loving, fun, playful and loyal personality of the Shih Tzu without all the hard work of the long coat and profuse hair. If you keep your shih tzu in the shorter coat then the shorter hair is a non-issue. Here are some photo's that I found on the internet of Prapso pups. If you do your research there are know Prapso breeders.
? 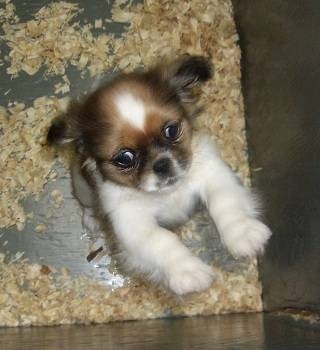 Do I have a prapso shih tzu puppyAfter months of searching for my perfect little shih tzu I finally found him. I decided not to take any chances and used a KC assured breeder. We had to choose between 2 beautiful but very different pups, one was a very fluffy black and white male with a perfect chrysanthemum face and the other was a very sweet slightly smaller brown and white little boy who did have a slightly different look about him. As my 2 daughters were both smitten with him and and I couldn't choose between them I let them decide. His coat appeared to be shorter than the other pups particularly on his face but I wasn't worried because he came with all the paper work and the breeder had mum and dad there to see who were perfectly normal looking KC reg shih tzu. I started doing a bit of research on the Internet and discovered the term Prapso puppy. We have only had little Leo for a few days and are totally in love with him and would not swap him for the world but I would like to know if he is a prapso. How fascinating! I'd never heard of this phenomenon before- apparently a small number of Lhasa Apso (and Shih Tzu, apparently) are missing the gene for profuse face and body hair, ending up looking more like Tibetan Spaniels or Pekingnese (they still have long hair, but it's more like fur, not human hair, and they have clean faces.) The genetic basis for this anomaly is still not clear, and I wouldn't blame your breeder if he is indeed a prapso. I really can't tell you what he is without pictures, especially at such a young age, but I personally find the "prapsos" just as attractive (or more so, actually) than their normal-coated siblings. 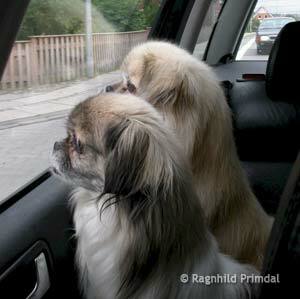 Their coats are also much lower-maintenance than normal Lhasa or Tzu coats. That is something that isn't going to be truly apparent until he is old enough to have a full adult coat, usually around 14 months or so. BTW, KC registered, at least in the United States with the AKC, does not denote quality. ANY AKC registered purebred dog being bred to another AKC registered purebred of the same breed will have pups able to be registered... there are no inspections or tests or certifications of breeders and those papers only mean that the parents WERE AKC registered, nothing about how well they fit the breed standard nor what health testing they had done prior to the breeding. It is also possible those pups had different fathers if the breeder has other breeds. It happens. You can compare it to registering a car... just because it is registered does not mean it runs!!! Finally, have you contacted this breeder OR asked them about the incidence of Prapso in their lines?? In fact, I would have asked them about the differences in them before taking EITHER pup home. If I do ever get a prapso in my litter. 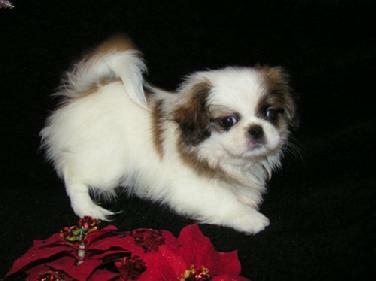 I will tell you and my pups will be sold for the same price as the Shih Tzu . Because they are are the same quality.